Storing logs, I would argue is the most important factor in the whole process of preparing your logs for burning, do this wrong and your logs could end up covered in fungus and mold. 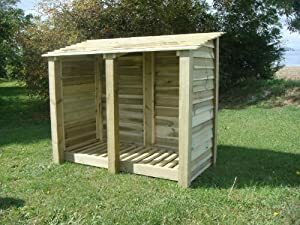 So what constitutes a good log store, in my opinion the main criteria are (1) the logs should be stored off the ground (2) A waterproof roof (3) good ventilation. 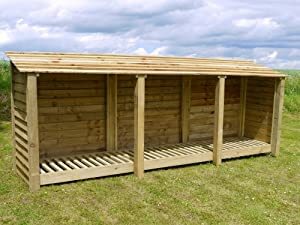 The Empingham Wooden Log Store, 11ft wide X 4ft high hand made from heavy duty pressure treated timber. The main aim of your log store, aside from a place to keep your logs, is to provide plenty of exposure to the sun and wind while at the same time preventing your logs from getting wet as far as possible. Perhaps the main thing for your wood store is to provide plenty of ventilation so that as your logs give up their moisture, it can evaporate easily with the assistance of any breeze or wind. If the moisture gets trapped in your log store, you will start to smell it after a while it’s like a damp smell. This is a bad sign because it means that mould will start to grow on your logs. With the above in mind, when you are stacking your logs, try to leave a space of at least a few inches between rows and if the back of your log store is a wall or fence, don’t stack the logs against it, leave a gap, and remember ventilation is crucial. Now let’s take a look at some of the wood stores available for storing logs both home made and commercially available. Here is an example of a home made log store, constructed out of readily available wooden palettes, a sheet of ply covered in felt for the roof, easy and cheap and ticks all the boxes for storing logs! Cottesmore 4ft Wooden Log Store/garden Storage, Green, Heavy Duty, Hand Made, Pressure Treated. Then there are the commercial available wood stores which are more pleasing to the eye and fulfil the main criteria of a good log store, a few examples are shown on this page. As you can see they come in all kinds of shapes and sizes and I guess your choice would be dictated by a couple of things (1) how many logs do you want to store and (2) where can you physically site them on your property. Another consideration for you, does your log store need a paved base, just like a garden shed would. These are questions worth asking before you commit to buy. Keep in mind the log store will be quite heavy when it’s empty, but just think on, how heavy will your log store be when it’s full of logs.